A day late and a dollar short… maybe. No approval from the FDA took place this week. 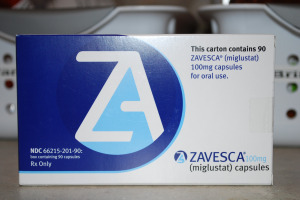 In other countries like the European Union, South Korea, Brazil, Russia, Australia and Canada, Zavesca has been approved for use in adult and pediatric patients suffering from this fatal disease called Niemann-Pick Type C.
Our understanding of the news that broke out a few days ago was that they want more testing done from pre-clinical and clinical studies to develop additional information. It appears that Actelion is committed to finding the additional information needed to show the FDA that this could be one of the first FDA approved treatments for Niemann-Pick Type C. Although this doesn't mean they will be cured, it could give someone like Brisan and Parker a few “extra” days living with NPC. As parents affected by this disease we are thankful that we currently have the opportunity to be apart of it even though Brisan and Parker aren't taking it. They will resume sometime in May this year. That presents a different challenge for our family because we currently are on COBRA. It will be interesting what 12 months from now will look like especially if it isn't FDA approved because our future insurer might say H-E-double hockey sticks NO!